The Young Rockers program is tailored for new young musicians. The goals of this course focus on learning how to work in a group, and on experimenting with different instruments. The Young Rockers course is designed to help newer musicians develop and hone the fundamental skills and habits needed to succeed in whatever direction they wish to go in music and in life. Young Rockers is set up to move at a pace regulated by the abilities of their individual group. Additionally, it allows for some limited individualized attention while in the full band setting, as well as in regular breakout sessions described below. 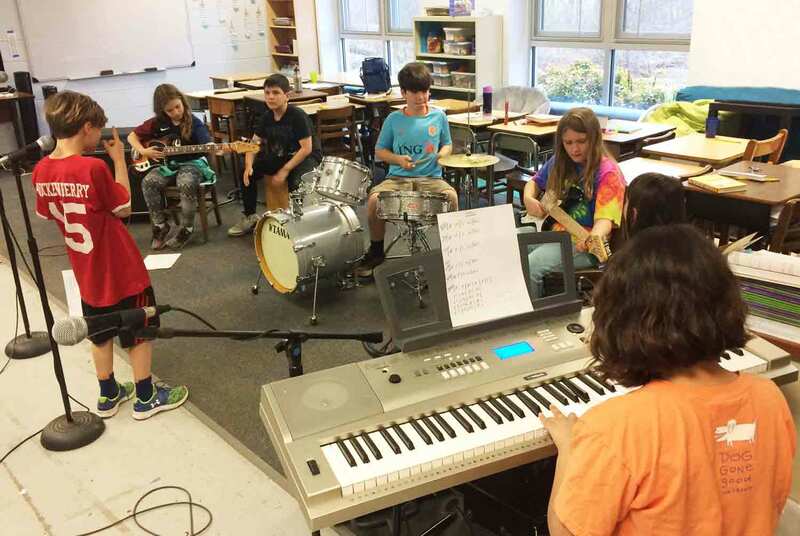 With this program, students will begin by learning to play a song in the group format, but will also get a chance to experiment with different instruments on other songs. This program is ideal for the younger musician, as well as the slightly older student who has not played their instrument for very long. It will also provide an opportunity for students struggling with their motivation to continue with their current instrument, to either deepen their knowledge or experiment with a different one. IIM staff members for drums, guitar, bass, keyboards and vocals are brought in as needed to focus on any specific help that arises with an individual instrument. On a weekly basis, at least two of the staff will be working with the band to guide them through rehearsals. Instructors will also work with each student more closely in limited 15-minute sessions once a month on an individual or small group basis as warranted, encouraging them to break down each song into small sections and work on those parts until they master them. Then, along with the other members of the group, they will piece those sections together into the whole song. Additionally, students also will be guided through the process of how to negotiate the selection of instruments for a given song, facilitated with how a group selects its songs, and coached on preparing for their performance of a live show. In all situations, they will be helped to navigate social interactions in a positive, assertive manner. Finally, they will have the opportunity for a mid-year in-house concert and two public performances at the end of the program (one in-house and one at an outside venue). Each weekly session will be one hour long, in one of four regular time slots: Rehearsal times occur in a one-hour block weekly to be determined by the schedules of the band members on either Mondays or Tuesdays. Rehearsals will begin mid-September and operate once a week (except for a Winter break in December). Once per month, to give students a more individualized experience, we will offer an additional 15-minute focused mini-session to assist players in mastering their instruments. Young Rockers will conclude by opening for the bands in the Rockers program at two of their performances near the end of May to early June. Tuition for the year is $850 per student, payable in either a lump sum or at $85 per month in the first week of each month from August through May (10 months). There is a $50 materials fee due with your application, and new enrollees pay a one-time $25 application fee. Checks are to be made payable to “Immersed In Music.” Credit card payments can be made online through our website.